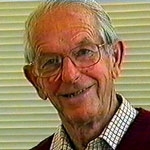 Video interview recorded in 2001 by Harry Kroto, Edward Goldwyn and John Sulston with John Walker. Scientist Fred Sanger is often considered the father of modern molecular biology, and is one of the few people to have been awarded two Nobel prizes. Working in Cambridge he developed a new chromatographic method for determining amino-acid end-groups. His new chromatographic results on the free amino groups of insulin were published in 1945 and the complete sequence of insulin in 1955. After feeling the way with other slower and less accurate techniques, the “dideoxy” method for gene sequencing was developed. It was for this work that Fred was jointly awarded his second Nobel prize. This 20 minute video shows sections from the extensive Vega archive recordings of this extraordinary man.